Q: How did you get into weather? When I was three years old, the mobile home in which my mom and I lived, in central Arkansas, was struck by what we believed to be a tornado. We were briefly airborne. Here's a link to the report in Storm Data: http://www.ncdc.noaa.gov/stormevents/eventdetails.jsp?id=9990684. Q: Describe the path leading up to your job at the SPC. How did it develop your interest in severe storms forecasting? I completed my undergraduate work at Jackson State University. During this time, I entered into federal service as a Student Career Experience Program (SCEP) student funded by the Storm Prediction Center and NOAA in August 2002 (the program is now called Pathways). This program allowed me to work during the school year at the NOAA National Weather Service Forecast Office in Jackson, Mississippi, and during the summers at the SPC in Norman. In 2004, I moved to Norman to attend graduate school at the University of Oklahoma School of Meteorology, where I completed my master’s and doctoral degrees. Once I finished my Ph.D., I became a Mesoscale Assistant/Fire Weather Forecaster. Q: What educational background helped you get to your career today? I received a bachelor’s degree in meteorology from Jackson State University in 2004, and an master’s and doctoral degrees in meteorology from OU in 2007 and 2014, respectively. Q: What is it about your job that interests you? I have loved forecasting for much of my life, and I even made several attempts at forecasting weather -- particularly severe storms -- as early as grade school. I was terrified of storms when I was younger. However, around high school, that fear evolved into a passion. 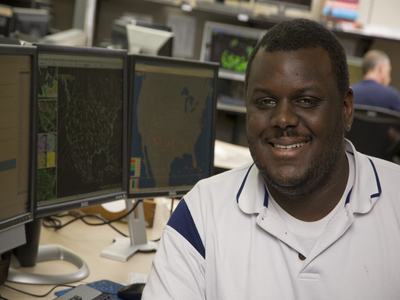 I pursued severe weather forecasting and research as much as I could throughout my early schooling, and I eventually became immersed in these topics when I started at Jackson State University. Q: What do you consider to be the greatest accomplishment of your career? The greatest accomplishment of my career was earning my Ph.D. in meteorology from OU. I was the first African-American male to earn such a distinction, and I had to overcome a lot to reach that milestone. See The Weather Channel feature about me: http://www.weather.com/news/video/black-history-month-a-scientist-making-a-difference. The second greatest accomplishment was becoming the first African-American to earn a master’s degree in meteorology from OU. Q: What advice would you provide to the up-and-coming meteorologists? I'd tell up-and-coming meteorologists a few things. Learn at least one programming language and be able to demonstrate that skill (Python, Java, C++, etc.). It will help you tremendously. Seek out federal internship programs. They are a fantastic way to get into the federal service. Attend conferences when possible and try to meet/network with as many people as possible. Q: What do you see yourself doing in 5-10 years? This is still undecided. I have many interests ranging from severe storms climatology/seasonal severe weather forecasts to leadership and research. The most memorable experience of my career was publishing a paper with former SPC director Joe Schaefer on the role of the El Niño Southern Oscillation on winter tornado outbreaks. That paper was instrumental for my career, as it helped demonstrate my ability to perform severe weather research to my peers and colleagues. Return to the Staff Profile Page.